This May we were blessed to present the 2018 Metro-Urban Institute Conference, Reimagining Faith and Community Collaboration in the Twenty-First Century. The keynote speakers, Marsha Foster Boyd, Otis Moss III, Leah Gunning Francis, and Jonathan Weaver, shared powerful insights regarding their hands-on experiences working in collaboration with other community entities. Workshop facilitators and plenary panelists represented local, national, and global perspectives. The conference concluded with the Legacy Gala Celebration, when we honored three Pittsburgh greats, Cecile Springer, Johnnie Monroe, and Jared Jackson. The Rev. Dr. Jonathan Weaver, senior pastor at Greater Mt. Nebo AME Church in, Bowie, Md., shares his wisdom and experience on how churches and congregations can take control and influence their financial futures. The Rev. Dr. Otis Moss, senior pastor at Trinity United Church of Christ in Chicago, Ill., delivers his plenary address, saying it's not enough for churches to worship, we must be the hands and feet of Jesus throughout the community. 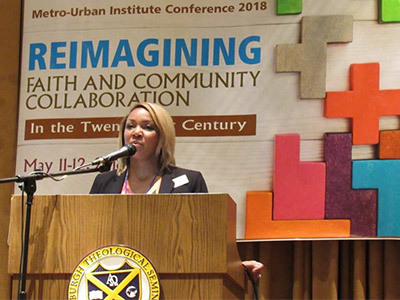 The worship service at the 2018 Metro-Urban Institute Conference featured a sermon by the Rev. Dr. Otis Moss, senior pastor at Trinity United Church of Christ in Chicago, Ill.